1. 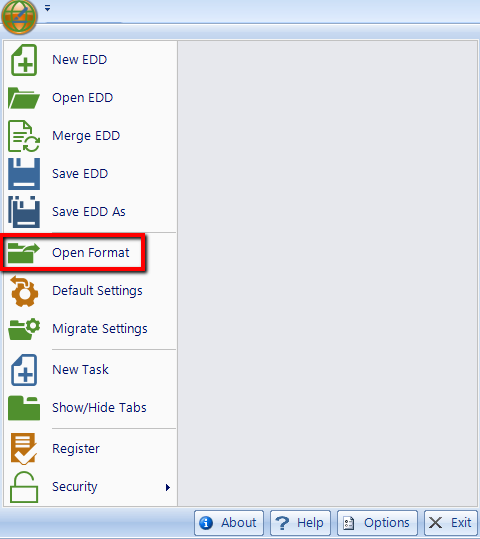 To open an EDGE format, click Open Format on the EDGE drop-down menu. Note: Alive formats are also supported in EDGE. To learn how to create an Alive format in Professional, read the EDGE Export article. 2. Select the RVF, if prompted. a.By default, EDGE will recognize .rvf files in the Format folder (EDGE>Options>Working Folders) and automatically select the first one. b.To select from multiple files present, click Select RVF from the drop-down list. Note: The most recently-used format and Reference Values file will open by default whenever EDGE is re-launched. Therefore, be sure to open the format and RVF files to be used by the field crew before closing, and/or instruct the field crew accordingly in the EDGE Field SOP.